Children whose parents are in conflict with the law are an invisible and often highly vulnerable group. By issuing this briefing, Penal Reform International (PRI) hopes to draw attention to the challenges they face and to encourage more effective implementation of their rights. 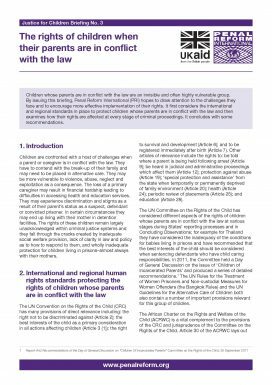 It first considers the international and regional standards in place to protect children whose parents are in conflict with the law and then examines how their rights are affected at every stage of criminal proceedings. It concludes with some recommendations. This briefing examines the key components of an effective and independent monitoring mechanism for children.